By knitting a variety of stripe patterns, you'll explore the basics of colorwork with helix knitting, then dive into mosaic and intarsia techniques. This class includes step-by-step instructions for making 4 exclusive class projects: Stripy Cowl & Slouchy Cap, Stripes-in-the-Making Bag and Upright Stripes Shawlette. Knitters will enjoy Beth's approach to colorwork using stripes as the main focus. 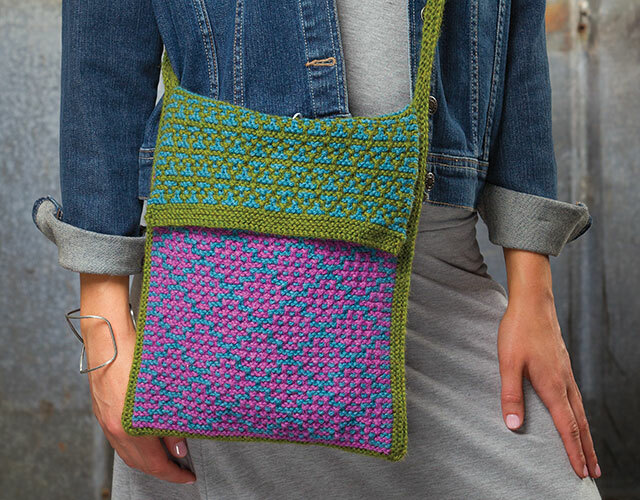 In this Annie's video class, you'll learn about the world of colorwork knitting from the ground up. In this "all things stripes" class, you'll learn how to use stripes as you explore the basics with helix knitting, and then you'll dive into mosaic stripes and progress to intarsia stripes. Note: The instructor uses the Continental knitting technique throughout this class. This class includes step-by-step instructions to make 4 exclusive class projects: Stripy Cowl & Slouchy Cap, Stripes-in-the-Making Bag and Upright Stripes Shawlette. Knitters will enjoy Beth's approach to colorwork using stripes as the main focus. If this is your first foray into colorwork, Beth will guide you every step of the way. You'll be inspired by Beth's teaching style because she makes learning the art of color knitting fun. Once you complete this class, you'll be motivated to continue on with your exploration and all that colorwork knitting has to offer. Work stripes using the helix knitting method. Use mosaic knitting for simple colorwork that uses only one color at a time! Utilize intarsia to work more complex color into your knitting! Use bobbins and make butterflies for working intarsia. Make 4 projects that teach you all the techniques in this class. Brilliant class! Excellent teacher! now I'm converted! I'm a fairly new knitter and am excited about what I learned about different colorwork techniques. The class projects are perfect for practicing what was taught in the video. I feel prepared to move onto more advanced techniques now. I recommend this class.